The plan is our most important corporate document and is central to understanding our organisation, our roles and functions, and our strategic direction for 2013–18. The plan sets out the direction of our science and technology (S&T) capabilities and will help guide our research, collaborations and business activities. 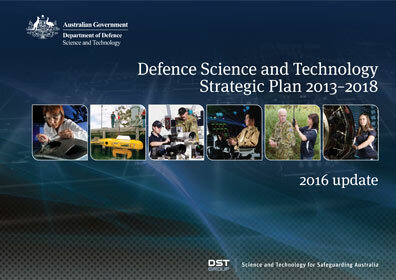 It is the foundation of all our activities as Australia’s leading S&T organisation safeguarding the nation by delivering valued scientific advice and innovative technology solutions for our defence and national security. Implementing the initiatives in the plan will ensure we continue to build on past successes and our strengths as a valued adviser to government, innovation integrator and collaborative partner. being a valued organisation with a more collaborative and innovative culture.